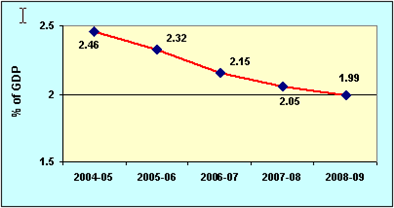 Union Budget 2008-09 has allocated Rs. 105,600 crores for India’s Defence. 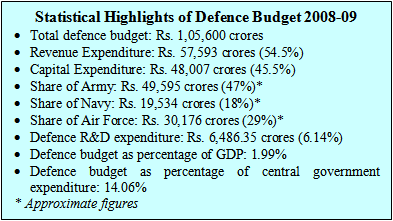 Crossing the one lakh barrier for the first time, and accounting for nearly 14.1 per cent of total central government expenditure, the Defence Budget looks quite impressive (see Box). But when seen in the context of India’s expanding interests, this allocation remains as moderate as ever. Moreover, an in-depth analysis reveals problems in defence and budgetary management, none of which show signs of abating. For fiscal year 2008-09, India’s defence allocation has increased by 10 per cent over the previous year’s allocation of Rs. 96, 000 crores, and by little over 14 per cent compared to last year’s revised allocation of Rs. 92,500 cores. In the last five years, the defence budget has increased by nearly 37 per cent from Rs. 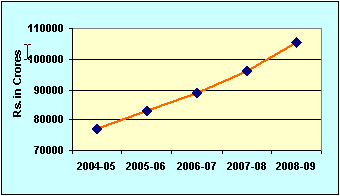 77,000 crores in 2004-05, which represents over 8 per cent growth per annum (Figure-1). Notwithstanding the current allocation and growth of the defence budget over the years, the question remains whether India’s defence spending is compatible with its economic and security interests. A brief survey of the Indian economy reveals its great potential and global reach. The economy registered an average growth of nearly 8 per cent a year during the 10th Plan, and seems set to continue the growth momentum in the 11th Plan period. What is more important is that much of this growth is driven by the external sector, mainly growing trade with the rest of world. India’ total trade (exports plus imports) has increased by more than five times in the last decade and now accounts for over 35 per cent of its gross domestic product (GDP). This testifies to the fact that the economy is much more globalised than, say, 10 years ago when trade accounted for less than 20 per cent of GDP. The growth of the Indian economy and its global character has also infused confidence among international investors who see India as an attractive place for investment. The growing inflow of foreign direct investment is testimony to this fact. This process of greater integration with, and concomitant acquisition of greater stakes in, the international economic system is likely to continue in the coming decades. Military capability is necessary, for instance, to protect the country’s sea lines of communication – 90 per cent India’s trade by volume and 70 per cent in value moves by sea. A survey of the regional military balance shows India’s unfavourable position vis-à-vis its neighbours. China’s relentless military modernisation, backed by double-digit growth in military expenditure for more than a decade, is a case in point. Its military modernisation, exemplified by the recent demonstration of IT- and space-based capability, has expanded its military reach from the traditional battlefield into the ‘space and cyber-space domains’. This is besides the other ‘anti-access/area denial capabilities’ developed through a range of modern weapons systems that, according to a 2008 Pentagon Report, have left even the United States worried. Given the long-standing India-China border dispute, China’s war preparations for winning “local wars under conditions of informationalization” together with its massive infrastructure development along the border, have certainly given it a definite military advantage. At the same time, the sharpening of Pakistan’s armoury, especially with the help of US military aid, is no less worrying. Since 9/11, Pakistan has received more than US $10 billion worth of military assistance from the United States. Such assistance, which includes F-16 fighter aircraft, air-to-air missiles, cluster bombs, air defence radars and surveillance technologies, has direct security implications for India, since it narrows the advantage in conventional warfare that has been in India’s favour. Given the above imperatives and the moderate nature of India’s defence spending, the question arises as to how much India should spend on defence. Though an answer lies in a complex set of issues ranging from the nature of threats, the fiscal health of the government and the kind of diplomacy it chooses to pursue, yet some statistical references can be drawn from other countries that are devoted to building or have attained world-class military capability. 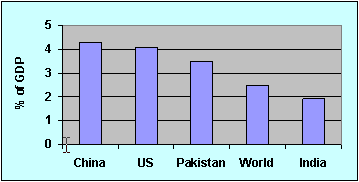 While the United States, with a military budget (for Fiscal Year 2009) of more than $700 billion and a share of nearly 50 per cent of global military expenditure, remains the largest military spender in modern times, India’s defence budget estimated roughly at $26.5 billion for 2008-09 constitutes a mere two per cent of the global total. In terms of proportion of economic resources devoted to defence, India’s latest defence budget, which accounts for 1.99 per cent of expected GDP in the coming Fiscal Year, is less than the global average of around 2.5 per cent, and lags behind America’s 4.1 per cent and Pakistan’s 3.5 per cent (Figure-2). In absolute terms, India’s defence spending, ranked 10th in the list of major spenders in the world, constitutes a fraction of the American military budget and less than half of China’s ‘under-reported’ but official defence budget of $57.22 billion for 2008. Given the higher proportion of economic resources being devoted to defence in these countries, should India raise its defence allocation, say, to 3 per cent of GDP? The answer lies in the adequacy of the present budget to meet the country’s security requirements. As the evidence shows, the proportion of financial allocations made available to the defence establishment vis-à-vis its demand has increased to nearly 95 per cent in recent years, even though its share in GDP has decreased significantly in the same period (Figure-3). This indicates that there is hardly any shortage of funds to meet the defence establishment’s financial requirements irrespective of its share in GDP. In any case, the fixing of defence allocation to a certain portion of GDP is not theoretically a sound proposition, given the volatilities in economic growth rates and threat perceptions in the long run. What is more important is that the security requirements, which ultimately get translated into the annual defence budget, need to be adequately financed. Source: CSO and RBI for GDP figures; DSE for Defence figures. A close look at the formulation of the Indian defence budget, however, reveals little evidence of the country’s security concerns being properly addressed or financed. The annual defence budget, which follows from the Defence Capability Plan, 15-year Long Term Integrated Perspective Plan, 5-year Services Capital Acquisition Plan and Annual Acquisition Plan, is handicapped in terms of catering to the true security needs of the country because of the poor formulation and execution of, and inordinate delays in, planning. In other words, the security needs of the country are poorly reflected in the budget, and the capability requirements of the Armed Forces either get delayed or come to possess a short shelf-life. As a result, the Armed Forces are under-prepared to meet any worsening in the security scenario as well as technological upgrades by adversaries. Another major problem in defence management, as reflected time and again in successive budgets, is the inability of the defence establishment to fully utilise the allocated funds, especially those meant for the modernisation of the country’s security infrastructure. 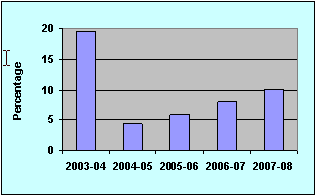 Though the modernisation expenditure, credited under the ‘capital expenditure’ of the budget, has increased considerably from nearly 25 per cent in 2000-01 to over 45 per cent in 2008-09, the problem of timely utilisation of allotted resources continues to haunt the defence Services (Figure-4). As the latest budget reveals, out of Rs. 41,922 crores earmarked for ‘capital expenditure’ for 2007-08, Rs. 4412 crores, or over 10 per cent, remained unutilised. These unutilised funds, which mean opportunities lost or delayed in acquiring needed capability, have become a regular feature despite reforms in the acquisition structures/procedures. An examination of the capital acquisition structure/procedure reveals several weaknesses in the system: poor planning; deficiency in formulation of qualitative requirements; lack of motivation for indigenisation efforts; single-vendor approach towards selection of weapon systems; poor human resource and information management; ‘large number of submission and approval points’; and ‘multiple agencies with dispersed centres of accountability’. The cumulative effect of all this is a gap in the capabilities sought by the Armed Forces; under-optimisation of the huge resources spent over the years; and a poor self-reliance index. With the above deficiencies, the Indian acquisition system defies the best international practices prevalent in counties such as France, the UK and Australia. In contrast to the Indian system, the acquisition process in these countries is undertaken by an integrated body encompassing all the stakeholders – Armed Forces, Industry, R&D organisation, quality assurance organisation, civilian bureaucrats and other skilled workforce. This integrated body is responsible for all acquisition functions, right from the planning level to the disposal of equipment, and thus owns the responsibility of the whole life-cycle process of any equipment or system. The advantage of this integrated body lies in its single-point accountability to provide timely solutions to the Armed Forces’ requirements and, in the process, it provides the best value for money and also a thrust towards self-reliance. Keeping the above merits of the integrated acquisition organisation in mind, India could possibly adopt a similar institutional arrangement for expediting its acquisition process. As regards self-reliance in critical military technology and production of advanced weapons systems, India, despite decades of effort, has remained import-dependent. The poor self-reliance index of 30 to 35 per cent against the target of 70 per cent by the end of 10th Plan testifies to this fact. Inadequate budgetary provision for defence research and development (R&D) is the major reason behind India’s poor defence industrial production and heavy outflow of financial resources to foreign suppliers. Overdependence on foreign suppliers not only has its costs and industrial disadvantages but also provides opportunities for corruption and delays in procurement. The present allocation of Rs. 6,486.35 crores for defence R&D constitutes a mere 6.1 per cent of the defence budget. In contrast, major military powers spend a much higher proportion of their budgets on military R&D. For instance, the United States spends around 16 per cent of its defence budget on R&D. American dominance in military technology and production of sophisticated weapons systems is the result of higher allocation, concerted efforts in the right direction and involvement of industries in research activities. In India, almost the entire defence R&D activity is undertaken by the DRDO (Defence Research and Development Organisation), with little budgetary or technological support from the defence industry, which largely comprises of state-owned Ordnance Factories and Defence Public Sector Undertakings (DPSUs). The private sector, which is a key contributor to civilian technology and a key driver of economic growth since liberalisation began in the early nineties, is still kept out from contributing to military technological advancement. The absence of R&D efforts by the defence industry has forced the DRDO to concentrate on every aspect of military technology, many of which could be undertaken by the industry itself. As a result, a very small proportion – 8 to 10 per cent of R&D budget – is percolated down for fundamental research. If India wants to be self-reliant in critical military technology and defence production, it needs to enhance its R&D spending. At the same time, increased allocations need to be channelled in the proper direction, and industry, including in the private sector, needs to be engaged in R&D activities so as to make DRDO focus on key and critical technologies. Considering its economic and security imperatives, India’s defence spending is not only moderate but also fails to capture the true security needs of the nation. The defence budget, because of the problems in the acquisition system, is constrained to translate budgetary resources into required military capability in the given time and at optimal cost. To augment defence spending, what India needs is an efficient defence planning mechanism, backed by an integrated acquisition organisation. Also, given its poor self-reliance index, India needs to enhance R&D spending. Enhanced budgetary allocations should be channelled in the right direction, with the industry (including private sector) taking a lead in technology development.